And so the final film in this year’s trio of Oscar-nominated Best Animated Features – and the eventual winner – has come to DVD. One thing that must be cleared up, as fact, is that Happy Feet was not made and released to cash in on the mega-success of the documentary March Of The Penguins, a common mistake that more than several reviewers made when covering the film in its theatrical release. An animated film as complex as one like this easily takes three to four years to produce, meaning that while the documentary Penguins were marching across the world, Australian animation company Animal Logic was already hard at work on their film, the success of which can only mean Sony Animation execs rubbing their hands together in anticipation of their own penguin movie, the “mockumentary” Surf’s Up, being as popular. Penguins – especially movie penguins – are “in” right now the way dinosaurs were in the 1990s, so it’s no less surprising to note that DreamWorks are also getting in on the act with their Madagascar penguin spin-offs too. Let’s face it, penguins are cute, but Happy Feet has evenly split audiences into one half that loves the film and what it says, and those who felt somewhat betrayed that they were sold one film and came out of another. I must admit, as I sat down to watch the movie, that I couldn’t see what all the fuss was about…it seemed to be a perfectly enjoyable, if not expertly made, film that had a sense of playfulness about it and an extraordinarily high cute factor. The opening is as impressive as anything I’ve seen in recent feature animation, drawing the viewer in visually and enveloping the ears with the overlapping of several lines of song. These songs are the ones sung by the Emperor Penguins in their search for the right mate and the two we center upon, Memphis (Hugh Jackman) and Norma Jean (Nicole Kidman), are Mumble’s parents to be. Actually, the picking of somewhat random song snippets very much reminded me of the Elephant Love Medley in Moulin Rouge, in both the way the songs were interwoven and their orchestration; not helped by the fact that both films feature Kidman pulling off this same trick. In fact, while all the voices are good performers across the board, for some reason when Norma Jean spoke, all I could think about was Kidman in a recording booth acting out her lines. She doesn’t quite click like Jackman and Elijah Wood does as Mumble, and to be honest I was hoping that there was a reason that his parents were Marilyn and Elvis knock-offs, but there was no payoff and I couldn’t really see the point. The songs continue to fly thick and fast, to the extent that, even more than Moulin Rouge, the soundtrack is tailor made and screaming out for the CD album treatment. As we meet Norman Jean for the first time, I found her walking to be rather stiff. The shot didn’t show her off to her best advantage, and not having time to take in the setting, the characters, or to adjust to having penguins acting in this manner, I was left underwhelmed. The first thing that then struck was that these penguins, for all the marketing talk, are not photorealistic, and Norman Jean actually reminded me more closely of the pigeons in the Disney-distributed Vanguard Animation movie Valiant. These guys don’t look as real as “Jack’s” power animal in Fight Club and I wondered if you showed this to an actual penguin if they’d get the same feeling of zombiefication as we humans did watching The Polar Express!? Indeed, I must question whether Happy Feet has actually been directed or edited very well. As animated films become nothing more than feature-length special effects, it seems we’re entering a new era where live-action directors can enter the animation arena and call the shots, as opposed to when it used to be the other way around. An animation director, like a good editor, would have expert knowledge of timing and experience with big name actors when they move into directing features, like a Frank Tashlin, George Pal or, more recently, Rob Minkoff and Kevin Lima. The way things are becoming, with Robert Zemeckis pulling a whole heap of stars on board for such oddities as The Polar Express and the upcoming Beowulf, it takes someone with the knack to pull themselves back, or else the results can come over as being unintentionally amateur or more akin to lower-budgeted TV fare. Director George Miller, a live-action director who’s had more experience than most with computer-enhanced family fare (jumping from Mad Max and The Witches Of Eastwick to the Babe movies), unfortunately falls into this latter trap as he makes his first move to an all-CG environment. Here, and for all the epic quality Miller and his team bring to the screen, he also seems to get carried away with the 360-degree capabilities of the camera. It’s a trait all-too often seen in television animation (where the flashy nature of the shots adds “value”) and first-time CG directors’ output where the freedom to achieve any shot they can without the usual live-action boundaries outweighs their instincts in keeping visually sound. There are far too many swirling shots that zoom in, flip by and spin out, and oddly these shots are held longer than needed. Several times I wondered why some shots were not cut shorter, or cut in to a close-up or out to a wide shot to emphasize some important moments and character reactions; an instance of some inexperience, perhaps, from credited editor Christian Gazal, who doesn’t use his digital scissors to perfection. Anyway, the movie continues with Mumble’s birth and his development as a young penguin, feeding on a strong Finding Nemo vibe even down to having the young penguins attending “school”. Nemo seems to be a benchmark; several times throughout the film I noted similarities, not least in the opening, with the losing of the egg and safe recovery echoing Nemo’s early barracuda attack, and the disability of the later-born child (Nemo had a weak fin, Mumbles is different because he can’t sing). But then Mumbles switches on his tap-dancing happy feet and the movie starts to kick in and find its groove, pushing its not so top secret weapon to the fore. Especially baby penguins, and the whole success of Happy Feet can be summed up in the one shot in which baby Mumble expresses himself through dance to Stevie Wonder’s classic track I Wish, which Warners seem to be getting good mileage out of after sampling it for Will Smith’s Wild Wild West. At this point, everything seems to be working, the characters are gelling, the story has kicked up a notch into gear, and the music keeps coming. Visually, things get more impressive, especially the wide shot vistas that only betray their computer origins by being so clear. The mo-cap, perhaps since we’ve now had time to come to terms with it, is very well attuned to the characters, and John Powell’s score creatively blends techno synths with otherworldly chorus and strings. But there is an odd tone throughout: Happy Feet is obviously a fantasy, and one aimed at children, but the music track selection – which doesn’t grate as it might have or one could have expected – is definitely incorporated with a nod and a wink to the adults in the audience. Queen’s Somebody To Love gets another airing, this time by Brittany Murphy, though so much in the same style as Anne Hathaway pulled off in Ella Enchanted that I did wonder if it was the same recording! It’s credited to Murphy, but the similarity to such a memorable moment in another movie (again) pulled me out of this movie (again) for a second. I was also somewhat disappointed to find that the R‘n’B hip-hopsters who smother the soundtrack hadn’t taken the opportunity to remix the classic song Happy Feet itself – surely an obvious choice, something I felt sure was a certainty, and conspicuous in its omission. When the seasons have changed and we meet the now grown Mumble, he’s sporting a furry bow tie. One thing that can be said is that the filmmakers have done well to give each character little nuances like these to keep them identifiable, but for some reason, and while all the other penguins have swapped their white fur for blacker-than-black, Mumble retains a gray coat throughout, something else that isn’t ever explained. I was worried that Robin Williams’ involvement in the film might overshadow and dominate proceedings, especially given his multiple roles here. Although a Williams-voiced character doesn’t make an appearance until well after half-an-hour in, the comedian can actually be heard throughout the film as its Narrator. Due to the popularity of March Of The Penguins, Williams takes on decidedly Morgan Freeman-influenced tones. Since narration can be added, or at least have been changed late in production, one has to wonder if this, at least, isn’t intentional. Whatever, the choice works in Happy Feet’s favor, both as pastiche and in a true dramatic sense. When Williams’ onscreen character, Ramon, finally “arrives”, he’s nowhere near as recognisable (or irritating), due to an outrageous Mexican-sounding accent. I used to be a big Williams fan but overexposure in a series of mawkish films led to a drop in favoritism, a feeling seemingly shared with the majority of the cinemagoing audience. Luckily, Williams is slowly bouncing back, with unexpected roles in several darker movies (Death To Smoochy is a hoot), but it takes a good director to really pull him into new territory as an actor. Since something of a career renaissance in those types of roles, Williams is creeping once again into the kind of family fun films (Hook, Jumanji) that gave him such success. A smaller than usual role in the excellent Night At The Museum gave him room to shine, but here he is dangerously close to falling back to his old tricks, where he could end up being too familiar and the “same old Robin Williams” again, such as his “trying too hard” part in the awful Robots. Things in Happy Feet start to drag after Williams’ intro (not a fault attributed to him) and an exhilarating rollercoaster avalanche ride, when Mumble meets Lovelace. Here’s a more recognisable – and irritating! – Williams again (he gets two main title credits), in a role that’s borderline Jack Nicholson and would have perhaps been much better if he’d gone for broke and completely played it that way – Williams can just about do the voice. It’s here that the film starts to take on a weirder tone, and just as I wondered if it had lost direction – suddenly – within the space of two short scenes, the warmhearted musical comedy penguin movie turns into something much darker and unexpected – an environmental issues movie. And once the environmental messaging begins, the movie totally loses track and becomes a bit of a chore to sit through. While the message might well carry much merit, it’s heavy-handedly imbued and what’s not particularly clear for certain younger audience members without a primer is what exactly is happening onscreen or what the message actually is. Is it global warming, as alluded to in the melting ice, pollution, as witnessed by Lovelace’s six-pack talisman, or over-fishing? It all seems, no pun intended, like the script heads off in polar opposites, with “The Message” swamping the latter half of the film without remorse but still being slightly half-hearted. If Happy Feet had really wanted to convey its message, Miller would have killed off a character or two. Instead, Mumble ends up at “Marine World” in an Orlando theme park, next to a HAL-9000 phrase sprouting penguin that’s lost his mind (no, I’m not making this up, but I bet the filmmakers were). And then – for no apparent reason – Mumble is returned to his natural habitat, with absolutely no explanation as to why, or how he got back, within seconds, after the arduous journey he first made in the opposite direction! In fact, how Mumble gets from the zoo back to the South Pole must remain the biggest plot hole of 2006, even bigger than the Man Of Steel’s mysterious five-year absence in Superman Returns. Mumble’s return, it seems, is nothing more than an excuse to see more Busby Berkeley penguins, which is honestly, by now, an old trick. A late, late, almost movie’s end attempt to inject some character emotion in a way that actually connects with anything set up in Mumble’s core story falls flat when all it does it give way to more mo-capped dancing penguins! Make them stop, not stomp! While Mumble is cooped up in Orlando, the CG penguin/real-world human integration is very well done, but the human animation of the explorers landing on the plateau at the end (an homage, apparently, to March Of The Penguins’ French film crew) is just plain shabby, and a coda that has the humans of the world banning fishing from the area is as rushed, confused and confusing as the rest of the film. Some interesting ideas (the pull back from the penguin enclosure in the zoo to the city and then to show the world and then further back still) just don’t quite work, as the filmmakers’ excitement at pushing their environmental agenda gets in the way of just telling a simply good yarn. Happy Feet certainly presents a new look for CGI features, offering sights previously unseen in any kind of animated film, but I don’t believe it deserved to win the Best Animated Feature Oscar. It was something of a controversial choice even with voters, technically down to the fact that this was mo-capped animation to Cars’ keyframes, and creatively in that it promotes itself as a comedy but displays no assured actual wit as was in abundance in Monster House, to name the two competing films. Personally, on having finally seen “the dancing penguin movie”, I can’t quite fathom how it could have won when real home runs Flushed Away, Everyone’s Hero and Over The Hedge were completely overlooked and not even nominated. For a film all about finding your inner rhythm, Happy Feet sure has a lot of strange beats. Being an animated – and therefore “kids” – title, Warners have gone their usual route and supplied only the lightest of extras which, given the success of the film, its award win and the track-record of director Miller, seems a little odd when a commentary at least should have been forthcoming, accompanied by a featurette on new company Animal Logic and their processes. The disc starts out with theatrical previews (easily skipped by pressing the menu button) for Harry Potter’s next, The Order Of The Phoenix, plus Fred Claus and what look to be DVD trailers for Imax Deep Sea 3D, The Nativity Story and Nancy Drew though no distinction is noted. A PSA spot on Seafood Watch alerts us all to be careful of the fish we buy and eat, which goes a little way, I suppose, to clarifying the movie’s message. Jumping forward to the menus, and we’re given toe-tapping affairs with baby Mumble hot-footing it away on the main screen and still images on others. Hopping to Special Features highlights several options, the first of which is a deleted scene, Mumble Meets A Blue Whale. Director Miller – who comes over just as someone who could have made a movie this nuts would – introduces a scene that’s been completed for this release in tribute to Steve Irwin, who recorded lines for two characters in the film but had this one cut out. With the intro, the clip lasts 3:15 and demonstrates that the main feature contains way too many shots of dancing penguins when good stuff like this was lost. Featuring Irwin in a second role as a high-flying albatross that Mumble meets on his journey, this would have been one of the warmest moments in the movie (one instance of language aside, which could have been dropped), specifically down to Irwin’s good nature. Shame it wasn’t in Happy Feet but a real bonus to have it here. A Happy Feet Moment, without any context, is more of what’s wrong with the movie – a questionable 30-second clip that has one adult penguin kicking the crud out of baby Mumble for no apparently reason. Once the penguin has demonstrated his football skills with Mumble as the ball, he kicks him off into the sea to score a “goal” – surely not the right thing to be promoting in an environmentally conscious movie about preserving such species? It can’t have been a deleted scene, so put this down to a mo-cap test or broken animator who finally strained under the insane production, cracked up, lost the plot and thought this might be “fun”. Dancer and co-choreographer Savion Glover pops up next for Dance Like A Penguin: Stomp To The Beat. Not the behind-the-scenes special we might have hoped for, and though there is an attempt to explain some real technique (hey, “balance!”), it’s really just an opportunity for Glover to show off his own happy feet for five minutes. Baby Mumble joins him for a moment, but the integration between them isn’t too hot considering how such things are supposed to be simpler and more convincing to pull off with CGI. A pair of music videos are next, and we’re presented with Gia’s Hit Me Up (3:21) and Prince’s The Song Of The Heart (3:00). I had no idea that the Gia song, which gained lots of airplay, was associated with Happy Feet and had put it down to being a Christina or Beyoncé track. The video is pure MTV as opposed to something cheaper put together for a DVD, and the values show even though it does the classic movie-video thang and intercuts shots from the film it’s promoting. While the producers managed to secure the services of Prince for his song, the budget couldn’t obviously stretch to getting him to appear in the video for it, so the track here is presented entirely made up of movie shots. Please! No. More. Dancing. Penguins. I Love To Singa, a classic Merrie Melodies cartoon is a Tex Avery-directed, Chuck Jones/Virgill Ross-animated 1936 short. I’d have to check my Golden Looney Tunes collection, but off hand, it’s fairly safe to say that this hasn’t seen the light of a restoration. The cartoon, about song and another misfit bird – this time a family of owls – otherwise doesn’t have anything to do with the main feature and (title song, “Simple Simon” and Owl Jolson apart) isn’t a keeper in the purest Looney Tunes sense. The lacklustre presentation here shouldn’t push those on the fence into a purchase, but its eight minutes pass by quickly. Finally, a Theatrical Trailer is included, and this is the kind of film I thought we would be getting! Warners and Miller have been very careful to market the film as an Ice Age-ish comedy about a cute little baby penguin with crazy sidekicks for friends (something that even extends to the DVD cover), when really it’s about an adult penguin who goes off into the white wilderness alone and gets fished out of the sea by humans. But if only the rest of Happy Feet was as honest and fun as this trailer! Here we get the Spanish original of My Way, as sung by Williams, in special animation that was adapted to a different scene in the movie (the cute, baby Mumble-dancing teaser is available on the March Of The Penguins disc for those that need that). Interestingly, Happy Feet didn’t seem to get a true full trailer, so one wonders that, if we’d gotten more than just singing and dancing penguins and more of a hint the strange diversions the story takes pre-release, would the film have been as successful? Who knows, but this 1:20 trailer goes some way to explaining how the crowds were pulled in. Inserting the disc into a DVD-ROM drive wasn’t the “stompin’ good fun” promised, as once again I had trouble loading the InterActual player, only to find a couple of feeble weblinks. As a prominent title in this Spring’s line up, bolstered no end by its Academy win as noted on the stickers, Happy Feet will continue to appeal to those who haven’t seen it due to that darned baby Mumble, dancing away there on the cover and looking all cute (interestingly, international buyers get an alternate theatrical poster image on the front which serves the film much better). Outside, first-print run pressings get an identical art slipcover which promotes the “2 all-new animated sequences” and the film’s Heartland “Truly Moving Picture” award. Inside, a coupon sized tri-folded card illustrates the Seafood Watch initiative and how we can all do our small part in helping the environment. We’re reviewing the correct 2.40:1 widescreen presentation here on standard DVD and the results looks pretty darn good to me. Though overall the film is a mess, several scenes stick out visually, especially the rollercoaster avalanche, and given the awareness factor of the title, this could be a good system demo. Whites and blacks (apart from one teeny moment when I noticed some break-up in an underwater scene) are handled and balanced well, and I spotted a lack of mosquito noise despite the many instances it could have been a problem. Warners are also issuing Happy Feet in their joint standard DVD/combo HD-DVD format as well as making a Blu-Ray Disc release available. The lack of in-depth extras at least leaves the space for a pounding (and I mean pounding) Dolby Digital Surround EX track. As noted above, the rollercoaster avalanche could be a new system demo scene, given that this also impresses sonically. Actually, even given the choice of DTS, I couldn’t imagine there would be much difference given the punchiness of the mix and the strong, solid reproduction here. Instead of standard 2.0 surround tracks, for a change, French and Spanish audiences get the same option of EX dubs, with subtitles also available in all three languages. While it starts out as a Nemo-esque fantasy that manipulatively pushes all the right buttons, Happy Feet starts to drag badly in its second act and loses all sense of direction soon after. Heaven knows how the film picked up the critical support that it did, became a big hit with audiences, or went on to beat Pixar, of all studios, to win the Best Animated Feature Oscar, but it did, and any bad reviews from me or anyone else won’t put Miller and Animal Logic off coming up with another one or belittle his Academy win. 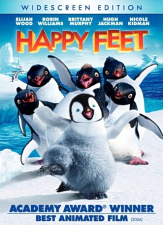 But Happy Feet, for all its successes, is not a successful film, and I’ll bet Warners were as surprised as anyone when the box-office numbers started to roll in after audiences were lured to theaters by the promise of tap-dancing baby penguins and another Ice Age. While I can’t say the film was badly made – on a Barnyard scale at least – its plot is a heck of a mess and can only truthfully be described as “unique”, but not for all the right reasons.